Skin infections, particularly with a diagnostic sign of rashes, are one of the most common reasons why young children pay a visit to the doctor. Adults are likewise affected by this skin problem; however, most of them opt for self-diagnosis and self-medication. 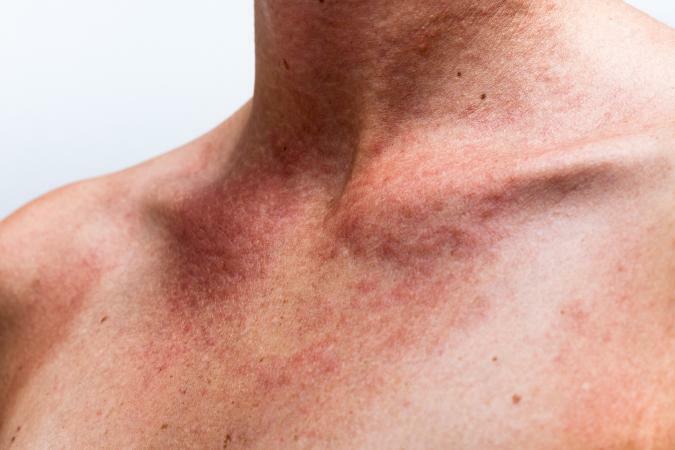 Identifying a rash is never an easy task, and it is even more difficult because a single type of rash with a mosquito bite-like resemblance can have different causes and relatively generic symptoms. 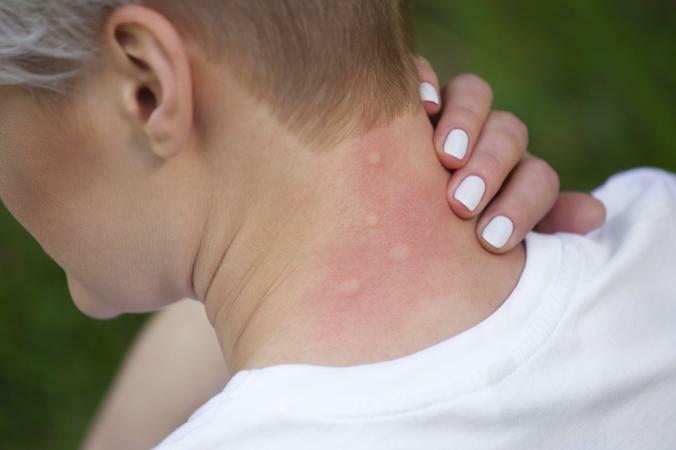 As a result of allergic reactions to food, viruses, metals, bacteria, and other irritants, mosquito bite-like rashes may develop on the skin. In most cases, rashes are not indicative of a dangerous condition, but on some rare occasions, they are. When you discover a rash, maximize your time when taking note of what the rash looks like. Take note of how long has it been present, how widespread it is, whether it is itchy or not, how big, and how many marks you have. The lining of the skin contains numerous mast cells, which are designed to attack and kill parasites. These cells carry chemical-filled bags including a protein called histamine. When the body undergoes an allergic reaction caused by an allergen, the body releases histamine. Once released in the bloodstream, the fluid leaks out of the blood vessels, accumulates in the skin, and causes a rash. Thus, itching, swelling, and irritation are experienced. 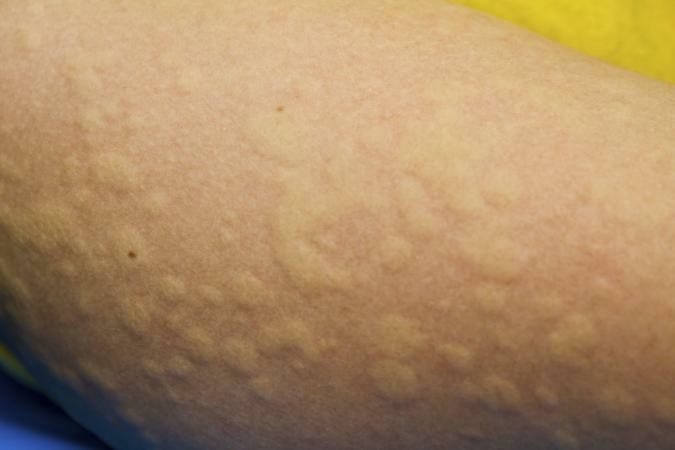 Hives are a skin condition that can appear similar to mosquito bites. What they look like: Medically termed as urticaria, hives are smooth, raised, and pink to reddish bumps or wheals that can range in size. They can also appear as ring-shaped, oval-shaped, or circular with a pale center and red halo or flare in the outer rim. Characterized by blanching, the redness of the patches can go away and turn pale once pressure is applied. Wheals also disappear in a few minutes to hours and replaced by newly formed ones. In general, the raised lumps appear in clusters, covering all or part of the body accompanied with very intense itching. What causes them: According to the American Academy of Allergy Asthma & Immunology, hives are often attributed to medication and food allergies. Triggers such as allergic reactions to pollen, pet dander or seafood are very common. There are numerous causes for your irritating skin allergies and some of them have surprising triggers. Working out or exercise: Many think that the increase in body heat triggers hives. But what actually prompts hives is your own sweat. Low temperatures: The cold climate can cause a flare-up to some people. This includes other cold-related causes like swimming pools or ingestion of chilled foods. Response to infections : Researchers found that several bacterial and viral infections, including tooth decay, have a role in hives development. Stress: High levels of cortisol (stress hormone) are associated with chronic hives and can exacerbate them. Sunlight and heat: Although a rare trigger, some individuals develop hives after sudden sun exposure. This happens if you have been indoors during winter. Your body can have a sudden burst and develop an outbreak of itchy red rashes. It can also appear in parts that are covered for months and then exposed abruptly to sunlight. Home remedies: The initial step is to discover your potential triggers. Avoidance of these is necessary to prevent incidence of hives. Healthy eating habits can decrease the possibility of hives. Cool baths with oatmeal can soothe an itchy rash as well. After bathing, apply topical medications such as calamine lotion or one percent hydrocortisone cream to the affected area to control itching. Applying an ice pack over the rash also provides relief. Additionally, cut your nails short to avoid scratching the rashes. Wear loose-fitting clothing to prevent further irritation to the affected skin. Over-the-counter drugs, like oral antihistamines, are also a preferred choice in blocking the release of histamine (the compound that produces allergic symptoms). When to see a doctor: If the hives don't go away after home treatments and have other severe symptoms like swelling in the lips and trouble breathing, go to the emergency room right away. In addition, for rashes that are accidentally scratched and have caused infection due to the open wound, consult your doctor. 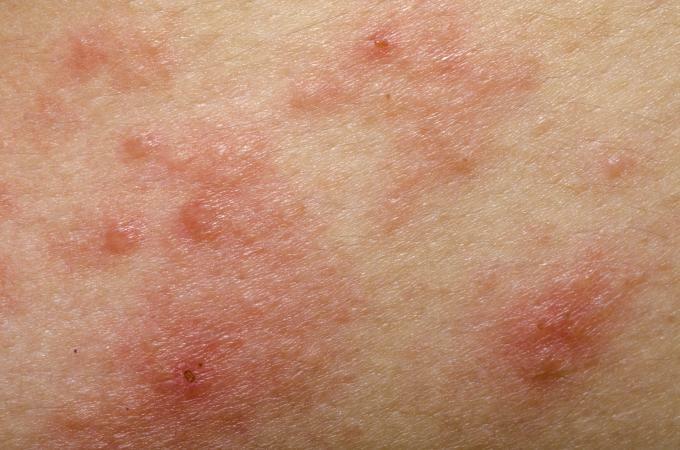 Miliaria is a condition that causes a rash with raised bumps on the skin. What it looks like: Also called as "prickly heat" or "sweat rash," heat rashes are a common ailment during humid or hot weather conditions. A heat rash looks much like hives. It features red, itchy, raised bumps on the skin. Unlike hives that affect any age group and are widespread, heat rashes are smaller and more common in children. It usually appears in areas where sweat is trapped like the neck, upper chest, or elbow creases. What causes it: Basically, the skin eruption is mainly caused by clogged sweat ducts during the summer season or hot temperatures. For example, an overdressed baby under the scorching heat of the sun can experience heat rash. Heavy cream use also contributes to the blockage of pores during physical activity. Home remedies: Heat rashes typically disappear after a couple of days of air drying. Loosening and removing clothing will also help. Allow the skin to cool down by keeping the temperature controlled. Stay in air-conditioned rooms or use cold compresses. Other heat rash treatment options include applying calamine or hydrocortisone creams to calm the rashes. It is also important to avoid other lotions as they can aggravate the irritation in your sensitive skin. When to see a doctor: A worsened heat rash over three to four days is enough of a reason to seek consultation. Immediate medical attention is needed for severe itchiness and rashes with pus and swelling. Irritant Contact Dermatitis may be the cause of a mosquito-bite like rash. What it looks like: Other than allergic reaction rashes, a more common type of contact dermatitis is the Irritant Contact Dermatitis. At first glance, this may be confused with hives since it shares most of its characteristics. It starts off as a red rash and bumps accompanied by itchy, dry skin. During a hypersensitivity reaction, the skin gives rise to raised papules in the affected areas. It can also appear as a scaling rash. Its distribution is dissimilar with hives though. In this type of contact dermatitis, areas that are only exposed to irritants are affected. What causes it: The primary cause is repeated contact with an irritant that rubs in the skin and damages the skin's surface. This is caused by a reaction to certain substances like detergents, perfumes, cosmetics, soap, metal jewelry, deodorant, or other personal care products. Home remedies: Avoid anything that caused the symptoms. Avoid all strong substances that can possibly irritate your skin. The constant friction of a clothing fabric makes your skin more susceptible to injury so choose cotton material over bulky fabrics because they are less irritating. Treat the area with hydrocortisone or anti-itch cream followed by a dose of antihistamines. Relieve mild to moderate symptoms with application of a wet compress. When to see a doctor: Severe symptoms such as painful and widespread rashes prompt a doctor's consultation. See an allergist and undergo patch testing if you can't pinpoint what is causing your rashes. Furthermore, if the rashes start to interfere with your daily activities and cause lack of sleep, seek medical attention. You don't need to go to med school to identify the root cause of rashes. With a little acquired knowledge and some tips on how to check for their characteristics, you can prevent their occurrence and treat the rashes yourself.